There’s more to being healthy than diet and exercise. Getting a good night’s sleep (every night!) is vital to your overall health. Logging Z’s not only benefits your day-to-day productivity, but it also boosts your immune system, improves your mood, prevents illness such as diabetes and heart disease, slows down signs of aging, enhances memory, and can help you lose weight. Solid shut-eye makes you feel good, sharpens your mind, and physically and mentally prepares your body for the next day. That’s because when you sleep, feel-good neurotransmitters like serotonin and dopamine are replenished and important hormones like human growth hormone and melatonin are emitted. But between busy schedules and life’s other distractions, it can be difficult and frustrating to get good sleep. So, if counting sheep just isn’t cutting it, here are 6 natural sleeping tips for you to start today. Just like diet and exercise, consistency is key. Adults aged 18 and older should aim to get between 7 and 9 hours of sleep every night, starting around the same time. 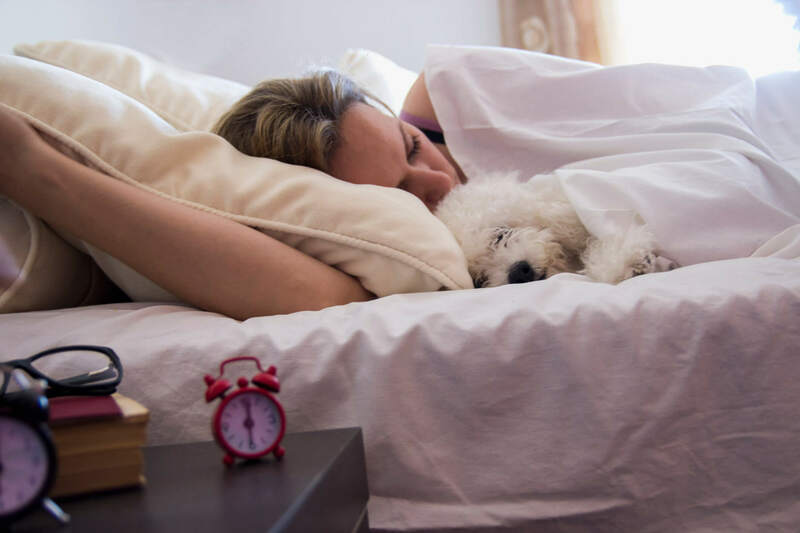 Maintaining a consistent sleep schedule keeps your body’s internal clock accustomed to the same bedtime, which will help you fall asleep faster, sleep better, and make waking up easier. Reserve your bed for sleeping only--that means no phone or TV! If you can’t fall asleep within 15 minutes, get up and read or relax in another room until you feel tired again. Even on weekends and holidays, try to go to bed and wake up at the same time. Set up a reminder to go to bed and an alarm to wake up, then stick to it! We know that day-to-day events and hectic schedules can hinder the best laid plans, but don’t get frustrated or give up if you miss your bedtime. Just remember that this process takes time, and the more you get into this healthy routine, the more restful sleep you’ll be able to achieve. So you’ve set a sleep schedule, now it’s time to establish a nighttime routine. Winding down before bed will signal to your body that it’s time to go to sleep. And you can start by decreasing screen time. From catching up on your favorite TV shows to checking email on your phone, the overuse of electronics before bed can interfere with sleep due to the blue light cast by TVs, phones, tablets, and computers. Set down your electronics at least two hours before your scheduled bedtime. Instead of watching TV and checking your phone, try reading, meditating, stretching, taking a warm bath, or listening to calming music. After a few weeks of your routine, you’ll have an easier time relaxing, allowing your mind to shut down, blocking out stressors or anxiety, and falling asleep. Ideal sleeping conditions differ from person to person. Some people may prefer the white noise of a whirring fan while others require total silence. If brightness bothers you, invest in blackout drapes. Waking up overheated in the middle of the night? Set your thermostat a bit lower. Studies suggest a room temperature of 65 degrees Fahrenheit is optimal for helping you nod off, as the dip in temperature suggests to your brain that it’s time to hit the hay. The beverages you drink during the day can affect your sleep pattern. Although alcohol is a depressant (which makes people feel sleepy), it can actually interrupt sleep cycles throughout the night, and stimulants such as caffeine rev you up. Though each person metabolizes caffeine differently, studies suggest that it’s best to abstain from caffeinated beverages at least six hours before bedtime. Instead, sipping calming chamomile tea or decaffeinated green tea is a great way to relax as part of your bedtime routine, ultimately helping to improve your sleep. A better night’s sleep may be as close as your kitchen. One study found that eating more fiber, less saturated fat, and less sugar throughout the day was linked with less restless, more restorative sleep. Limiting refined sugar and simple carbs, especially, can help keep your blood sugar levels steady and your energy consistent throughout the day, preventing you from reaching for a cup of coffee in the afternoon. It is also best to avoid heavy, spicy, and fatty foods in the evening as they can be difficult to digest, and indigestion before bedtime makes it harder for your body to relax and sleep. So try to eat your biggest, heaviest meals in the morning and your smaller, lighter meals in the afternoon and evening. Sleep, diet, and weight loss are all connected. Another study found that insufficient sleep is associated with increased snacking and caloric consumption, poor dietary habits, and obesity. So not only will better sleep help you snack less, but snacking smarter will help you sleep better. If you needed another incentive to exercise, squeezing in a workout during your day will help you fall asleep faster and enjoy a deeper sleep. One study found that moderate aerobic exercise, such as walking, increased the length of sleep for people who suffer from chronic insomnia. So sign up for a new fitness class with your friends or get in some extra steps by taking a walk at lunchtime. March 18th is World Sleep Day, which is a day dedicated to promoting awareness about sleep health as well as sleep disorders. But you don’t have wait until then to get a better night’s sleep! Being proactive about how to sleep better is just one of the many positive lifestyle changes that will help you reach your diet goals. Learn more healthy tips and connect with our online community when you start your Atkins journey today.